Here is my new (Rickey's old) 2006 Parker P-36 together with some of her ugly step 3rd cousin-in-laws. Your posts have everyone seeing red! (OK, I couldn't resist...). That's one beautiful family you have! 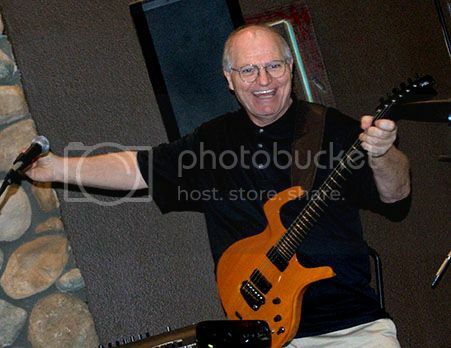 You really must check out Bugs Henderson's "Daredevils of the Red Guitar" CD. Nice guitars man, when can I come round. I've got a nice collection, but so far I've been too thick to learn how to post them. I like the scratchplate on your P36 and what's the white [and red] one at the back? Yoyo, the pickguard on the P-36 was made by a luthier in Bellingham, WA. 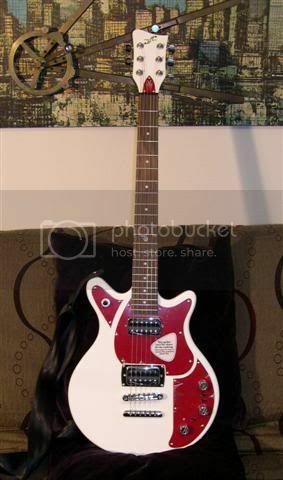 jamrcat owned this guitar until very recently and he had it custom made. I discovered the guy still has some of the material left over so I bought it and it should arrive soon. I'm going to try to make a matching piece for the headstock and the small cover on the back. 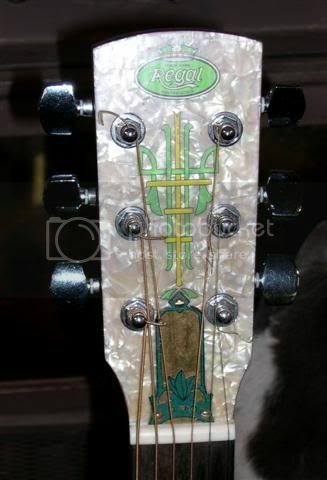 Check out the headstock on a Regal tricone I bought yesterday. I had the idea to do it before I bought this one but ya gotta love that mother of counter top on the headstock!! 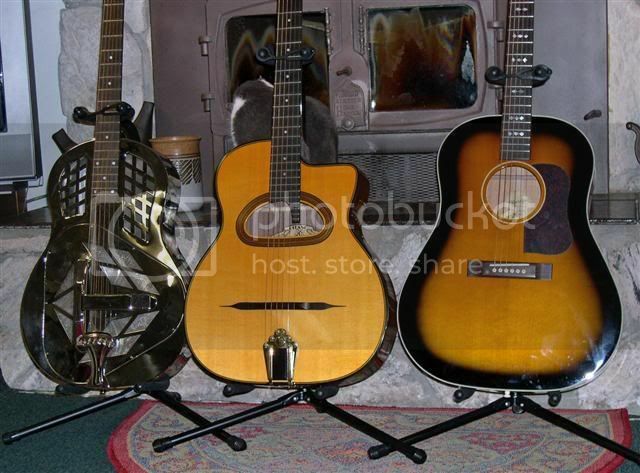 The guitar in the back on the right is a 2006 First Act VW GarageMaster built just for Volkswagen. They only built 1234 of them in all white with 4 choices of attachment color (white, black, blue, red.) These were given away with new Volkswagens sold in November last year as a promotional item. There are tons of them up on ebay and there is a lot of info available online about them with a little searching. They are just cheapies but cool as a Volkswagen collectibles if nothing else. 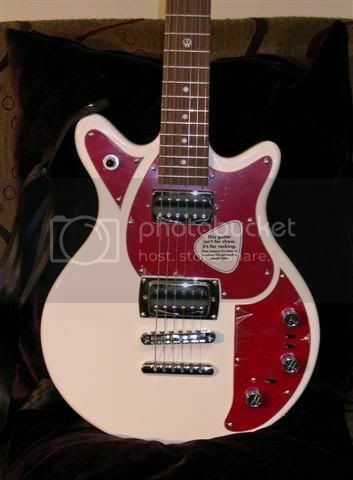 They are built in China with poplar bodies and basswood necks (very parkerish) and have an active output circuit and special cord so they can be played through a special jack on your new Volkswagen. They also come with a strap made of Volkswagen seat belt. Buy one cheap on ebay. Most of the people that got them with their car didn't even want them and are selling them. Thanks for the info, that Regal headstock wow....it doesn't get much better than that. I think the Vdub guitar looks great, but I've promised myself not to buy anymore guitars [but on the other hand]. I like the Django and the Gibson[?] too, in fact I like them all. I have quite an advanced case of Guitaritis. Hopefully I'll be able to show mine soon now the magic formula has been revealed.